Most of today's cameras are equipped with the option to record video, but it's something many photographers are reluctant to try. Naturally it not something that interests everyone, but not knowing where or how to start is clearly a barrier for many. Video shooting requires a different approach to still images, and there's plenty of terminology that's likely to confuse and intimidate those new to it. 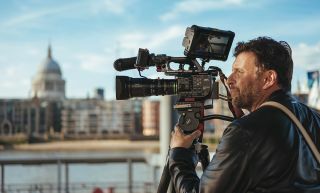 We wanted to cut through all this and get back to basics – what first-time filmmakers should use and how to use it – and who better to ask than Philip Bloom? Philip is one of the most sought-after filmmakers today, and he was kind enough to spend some time with us on the Sony stand at The Photography Show. Read on to find out how he works and what equipment he would suggest for beginners, as well as the essential techniques for professional-looking results. DCW: Are people better off starting with a small mirrorless camera or investing in full-frame option that will give them some growing space? PB: Even your phone is a good place to start because you'll already know the basic compositional skills as a photographer. But then you need to learn how to create sequences, which is telling a story across different shots. Pretty much every stills camera has video, but just use whatever you’ve got. The worst thing you could do – unless you’re super rich – is to buy a huge expensive camera. I do know people who have brought RED cameras for home video, and they’re never going to do anything with it because it’s just too much. The great thing about starting out with your phone is that you can edit on there quite easily. When you start shooting on a proper camera, you need to learn how to use editing programs like Final Cut or Premier Pro, or whatever it is you want to use. So just start with what you’ve got. If you have nothing, just use any camera that shoots video. You don’t need to shoot 4K yet. If [your camera] has it then that's great, but it’s not important and it will only add processing time. If someone were to go for an interchangeable-lens camera, what couple of lenses would you recommend they begin with? If they’re starting out with a cropped-sensor camera, I would always recommend a 35mm prime lens. That will teach you how to find your shots without being lazy with the zoom. The great thing about starting out with your phone is that you can edit on there quite easily. Walking around and looking at the shots with your eyes – that’s the best way to shoot. So, if you need to get a wider shot you move back and for a tighter one you move closer. That lens gives you a 50mm field of view, so for a full-frame camera you would want a 50mm lens. You can get really good cheap ones to start with and then build your lenses up from there. I have a lot of lenses and I carry around maybe four or five, but I know I’m just going to shoot with the one I’ve got on. What’s the main lens you tend to use? I have a 35mm lens for stills and video. It is wide but I like that field of view. It's more of a street photography lens, which is what I'm after. But it's too wide for ‘straight’ shooting because if you get too close it starts distorting faces. What kind of supports do you use and what would be best for a beginner? I hate rigs so if you can get a camera with a stabilised sensor then that's wonderful. I think the cheapest one Sony makes is the A6500, but there are other brands. I think Olympus makes them, and Panasonic has some stabilised sensors, although Canon hasn't at all. Rigs are a pain. They’re awkward and bulky, and they draw attention to yourself. I just like shooting with a viewfinder, which keeps it really small. The only downside to is – and I’ve had this since the EOS 5D Mark II – is that people see you filming and they think you’re taking a photo, so they freeze. Pop a microphone on top. The best starter one is a RODE VideoMicro, and it’s cheap. No [internal] camera microphone is any good. Some are better than others but you'll hear any wind on your recording. Also, a tripod. Handheld is fine, but there's nothing better than tripod shots. You don't have to get anything expensive. If you can get a fluid head then great. There are some small fluid heads – I think Manfrotto do a few – but they’re all quite heavy. Don’t start messing around with gimbals yet. They’re great but you end up moving the whole time, and you won’t end up editing anything because you'll just have long continuous shots. Think about your composition. Think of video as a series of photos that are connected. Move if the subject is moving. Don’t move if the subject isn’t moving. For example, if you’re were doing a shot in the show right now [at The Photography Show], if I did a pan across it with no one looking across it would look weird. But If I did a shot of the next speaker as he walked across to the podium and I moved with him, that would be a nice natural shot. Move if the subject is moving. Don’t move if the subject isn’t moving. What other accessories do you rely on? ND filters. No interchangeable-lens cameras I know of have built-in ND filters, although there are some with built-in lenses that have them. You need to keep your shutter speed at double the frame rate. So, if you shoot at 25p and you need to use 1/50sec. I was filming in here [at the show] and to get a shutter speed of 1/50sec I had to stop down to f/2.2 – anything wider was to bright. If you start putting your shutter speed up you'll interfere with the lights in here, and movement will look unnatural. Movement looks most natural at 1/50sec but as soon as you go outside you’ll need to use a variable ND filter. It doesn't have to be too expensive but if it's £10 you know it's not going to be any good because it will soften your image. But spend £30 or so and get one from a known brand and it should be OK. If you’ve never heard of them, check the reviews and do some research, because a lot of them out there soften your images. They way people tend to shoot video is to use too high a shutter speed, and that's a mistake because it looks unnatural. But variable NDs are an essential purchase. As soon as I got my first DSLR for video, the first camera I've ever owned without an ND filter, I realised I needed to get something for it. A fixed ND is no good because you won't have control over it at all. The way people tend to shoot video is to use too high a shutter speed, and that's a mistake because it looks unnatural. Get the shutter speed right and your video will look a lot better and more professional. What cameras do you tend to use for your work? My main video camera is a Sony FS7, but I have a lot of different ones. Walking around, when I'm shooting documentaries, I like shooting with smaller cameras too. For the main stuff I'll use a video camera, but for if I'm walking around and I don’t want to get too much attention I'll switch to the A7R III. That's become my main one because I also love doing stills. I’ve recently got the A7 III and I'm trying that out as well, and of course the A7S II for its miraculous low-light capabilities. And I’ve used the A7S II for shoots all over the world, everything from incredibly hot deserts to top of Mont Blanc. What’s the one thing you wish you knew when you started? It’s a very different world now. When I started, where we're at now wasn't in anyone's wildest dreams. When I started to buy camera kit it would cost you the best part of £80-90k, and that was 28 years ago. Now you can buy a camera for £500, and a lot of these cameras are way better than anything I started with. So, if I were starting out now, I'd say maybe say put me in cryogenic suspension and wake me up in 25 years! Many thanks to Sony UK for their help with this interview.